Why six? Because when you make it yourself, you add one more essential element...your own vision. Well, how time passes! The Model Goddaughter who 'walked' the runways of Vivian Westwood and Temperley, etc. over the past few years, (even graced a huge billboard over Harrods Department store one Christmas!) got married a year ago September, and now right on time is about to have her own little girl. 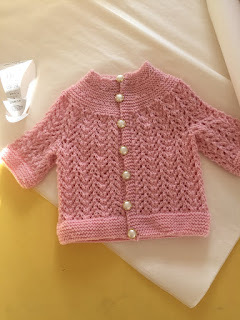 This pattern, the classic Elizabeth Zimmerman Best Baby Sweater in the world has already appeared in various colors and yarns on this blog already, including denim blue, wine red, ivory, a paler pink, and dark blue. I was visiting London last weekend and MG dropped by with her mum for tea to say thanks, which was lovely. But obviously, I can't wait for a photo of the new sprog in her designer sweater to add to my collection! In any event, this was the first time I learned to cut a fringe trim from the fashion fabric on the bias to obtain double the fringed threads I'd get from cutting on the straight. Then I anchored the fringe down the center using a 7mm dark navy braid purchased online. As it was, the result still looked too staid. 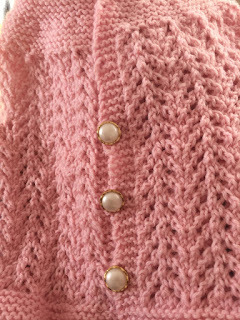 So I bought pearls in various sizes of my tweed colors and festooned them randomly across the pocket tops and down both fronts. I could have decorated the sleeve hems as well, but I knew that having fringe picking up chip dip might annoy me. 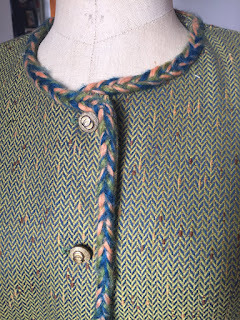 The pockets are lined, of course, and handstitched to meld into the tweed pattern invisibly. All the fringe and pearls were hand-stitched to the jacket body. This jacket may someday see a second life, as I can easily remove all the fringe and beads and tone it down or up some other way, depending on my mood down the road. 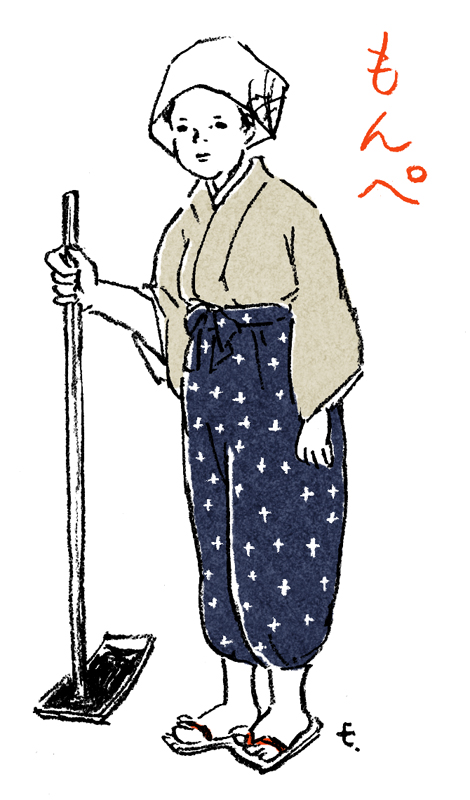 White wool trim might make it look more naval and spring-like, while strict silver braid would be more formal yet. Tweed too flat, but okay for day. Note "Chanel" buttons! the longer-waisted V7975 sober daytime option. Besides a Little Black Dress and a variety of jodphur/leggings to go under knee-high boots, (post to follow) there's another item I've always had on hand when I have to get out of jeans and look more grown-up and citified. Admittedly, that doesn't happen as often as it used to. 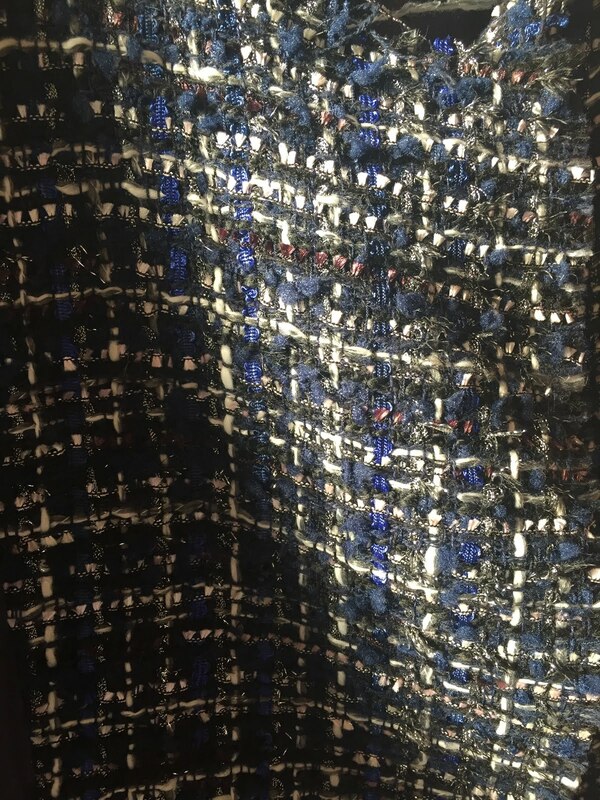 I have just cut out a lovely navy, black and silver bouclé to sew up—hip length with full-length sleeves and four pockets, two more than shown in the Vogue 7975 pattern. I've finished the body and am now adding four pockets trimmed with self-fringe cut on the bias and secured down the middle with navy braid. I'll post a photo of it as soon as it is finished! But as I delved into this project, I felt rusty about my design choices and fit. So I reviewed my 'Chanel-lite' collection so far. And I must say, I do love three of my home-sewn versions, but am less thrilled with a fourth. And frankly, they are all looking a little 'too loved.' Forgive their saggy, tired appearances in the photos above. It just shows how much they've been worn. So it's time I had a new one. 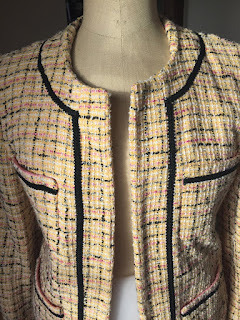 Very long ago, working at the BBC in London around 1979, I invested in a wonderful white bouclé wool and made the Vogue Designer tk. 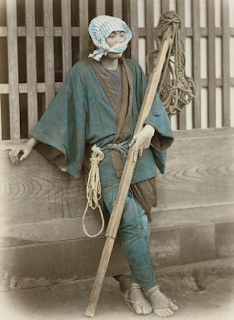 (photo below) And I bought the Vogue Designer Albert Nipon around the same time, (see below.) 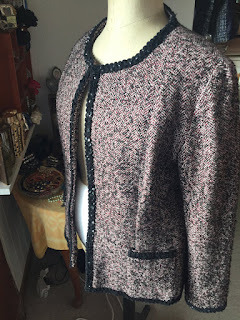 I've used Vogue 7975 and Vogue tk to make four pseudo Chanel jackets for evening or meeting/conference wear. I say pseudo, because I really do use the Vogue instructions which are less complicated than the 'classic' Chanel's. I fully respect those sewists who do the whole quilting-lining-to-bouclé-by-hand thing for true authenticity. Their results look great with nice fit and drape. And the chain is a nice bit of authenticity as well. I can't do it. I'm sorry, but I just don't like hand-sewing all that much. And I don't want a chain sewn to the lining running between the small of my back and the hard back of a concert seat for two hours, no matter how authenticate it is. The next Chanel experiment after the Hong Kong buy, around year 2000, was the black-and-wine bouclé hip-length version. Once I'd put the black braid around it, I wasn't satisfied. 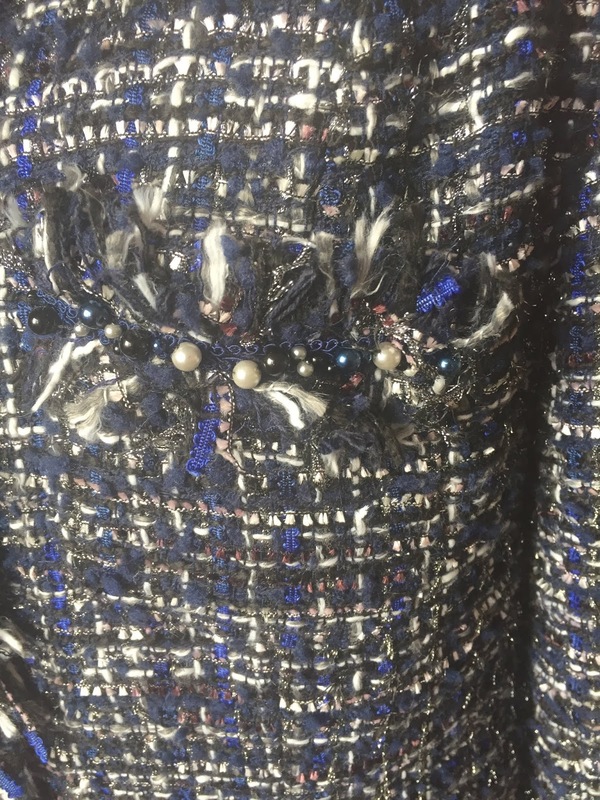 So a year later, I hand-sewed black sequins scattered along the trim. Now I was very happy. I've worn it to death over black skirts or pants ever since. 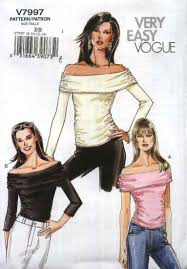 My favorite is the wool pink-baby-blue and bronze-threaded one from 2007, the shorter waist option of Vogue 7975 with three-quarter sleeves. But after a few years, I lent to my daughter in London. She brought it back needing a wash. I hand-washed it to protect the bronze metal threads from our village drycleaner and it now feels a little tight, still workable but maybe this baby needs retirement. I love the gorgeous fabric, a remnant from an elegant shop in Lausanne that closed. 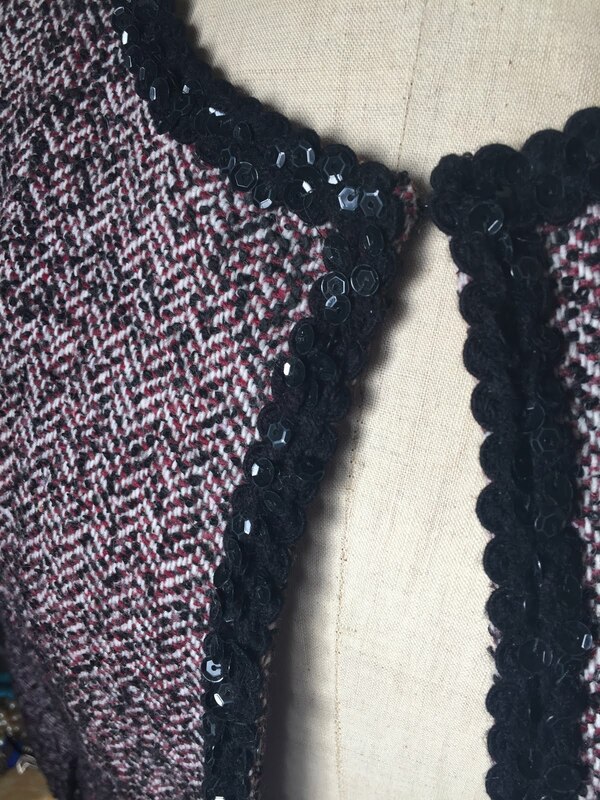 I braided my own trim with yarns selected to match the threads of the boucle. My bouclé here was less expensive than my wool choices, a cotton choice that looks great for spring with pink lining. 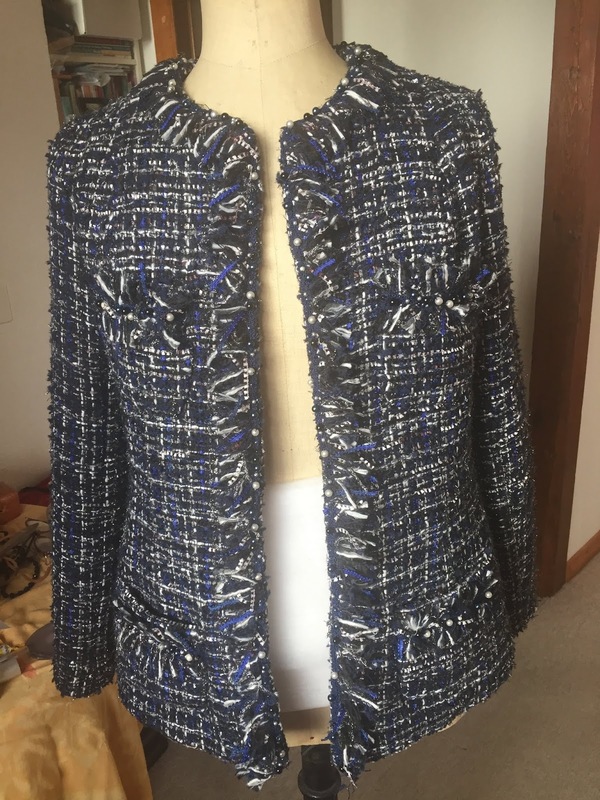 This Vogue pattern is boxier than the Vogue 7975 and has big shoulders that needed cutting down. 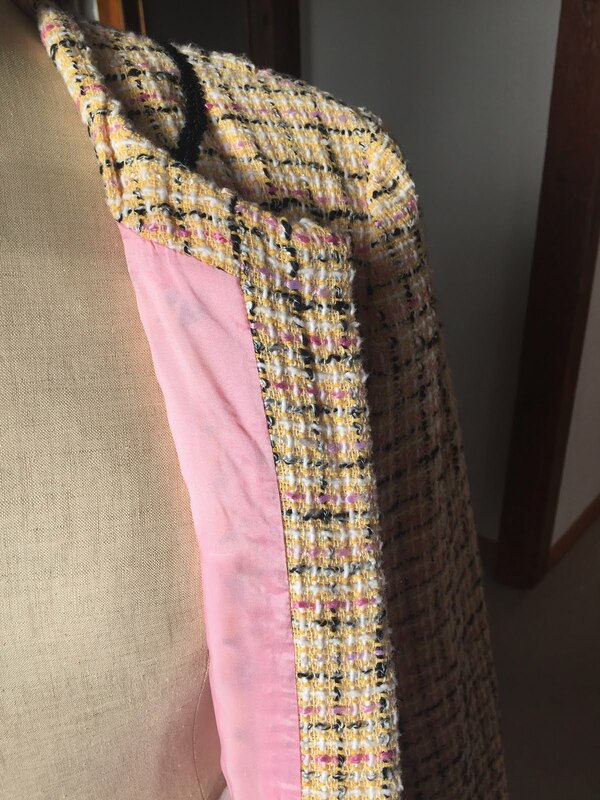 It also has a front seam that curves from the armhole seam into a dart and this construction doesn't lend itself to the traditional quilting process I skipped. I might use this pattern again because it fit me well and possibly the construction lends itself to matching discounted remnants of expensive fabrics. Fourth outing was my 'loser' in green. I used the longer length of Vogue 7975 again and made my own trim with braided yarns, but I think I don't get any buzz because I used a tweed remnant of a high quality wool that wasn't a bouclé. But at least I scored some imitation Chanel buttons! 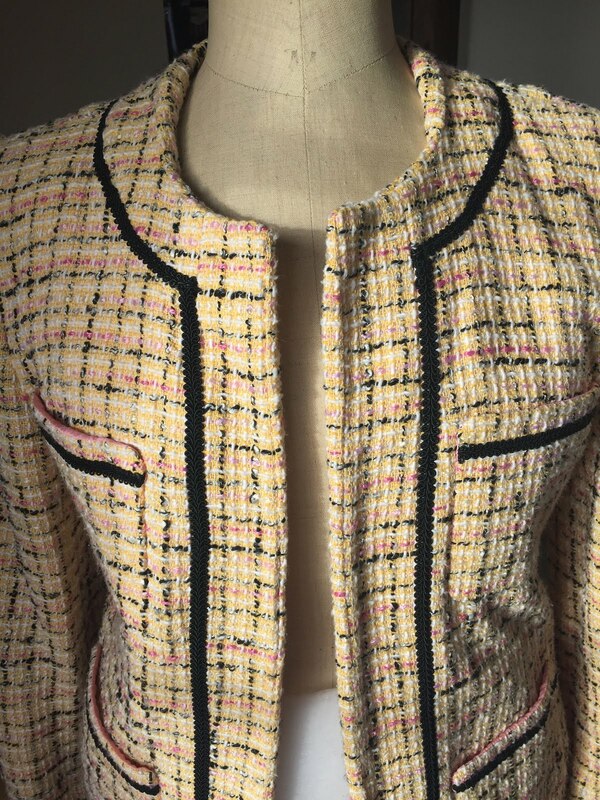 Even so, I don't like the look of a buttoned Chanel, especially as none of my sewing machines make perfect buttonholes. Live and learn. This definitely goes over jeans. Maybe my disaffection is also because my hairdo experiment as a redhead is over and my 'redhead' foray into green and jade colorways reminds me of some very, very difficult years past. 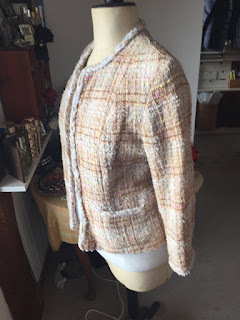 There are a couple of Burda jacket patterns I'd like to try. I think Burda measurements allow for more refining and I'm definitely not the body I was when I first sewed V7975. One option is a Burda Easy 2016 with the possibility of a flared sleeve and a peplum. 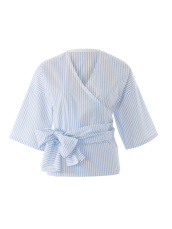 The other is the Burda Classic 2013 that includes a collar option. 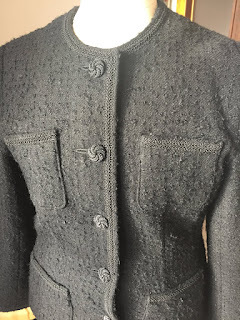 The one pattern I haven't been able to find is one that mimics the Chanel jacket shape featuring an upright circular collar that sits wide and clear of the neck. If you see one, please link me to it! Chanel said a lady can go anywhere if she has a LBD. The venerable Parisian perfume house Guerlain has even issued a series of perfume flankers over recent years, dedicated to the idea that the LBD is whatever you make of it, from tutu to black leather jacket. For the end of September, I was planning a Fri-Mon weekend in London to visit offspring. Having last year left an overnight bag of toiletries, makeup, and black cotton T and leggings as pj's with the litter, I wanted to travel ultra-light, with only a medium-sized black leather backpack to weigh me down airport-airport-bus-tube. 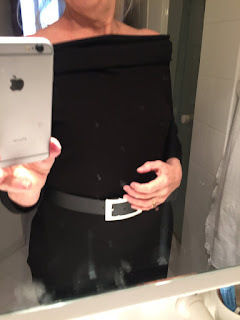 The obvious solution was to wear a black knit dress over a black camisole over black tights and short zipped boots (there would be a lot of city walking, so the ankle boots were low-heeled but not rustic) under a black Promod trench, to be perked-up from the crypt-heavy-blackness with bright jewelry and Hermes-style colorful silk scarves. 1. pull-on black Vogue OOP trousers in ponte. Kind of a neutral no-style at all statement. 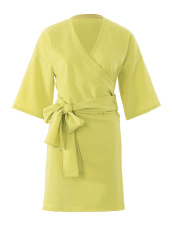 5. short-sleeved, collarless purchased viscose H&M wrap dress, showing its age. I'm considering using that classic Vogue DVF knock-off pattern to make a new black version of this with its 3/4 cuffed sleeve and collar detail. I know I'll use it a lot. In the end, I took the viscose wrap dress because it was right for day-to-night and I'm too fond of the home-sewns to consider I might leave one of those in London. 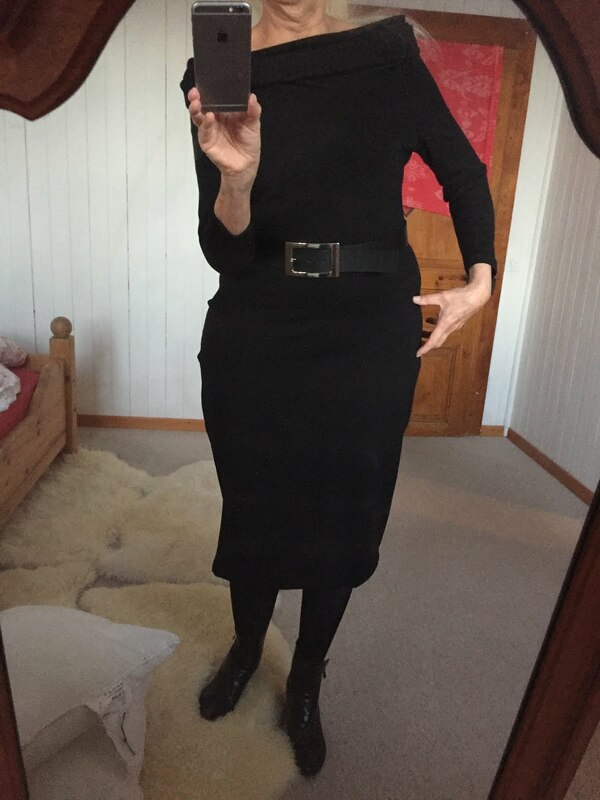 But when I got home, I added this new LBD to my collection which I hope has day-night potential for travel. I've worn it already to a concert at Victoria Hall in Geneva. I liked the Meghan Markle neckline vibe. This is Burda Easy's SS 2018 knit sheath with the bandeau neckline in a black viscose solid enough to give the collar some body and resilience. With the neckline pulled low, it works as an elegant evening cocktail dress but released higher up with a shawl or scarf or under a cardigan, it can go out in the day. As usual, the collar bounces off the shoulders a bit too much if I'm overactive. I'm considering finding a way to keep it down without permanently tacking it. 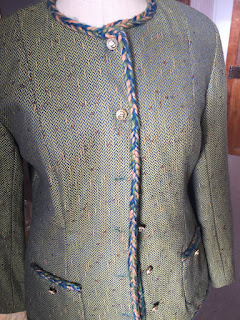 As unglamorous as it is, sometimes there is a workhorse in your wardrobe that you made without too much thought the first time, had to remake because you wore the first one out, and golly, have to make a third time because it's proved to be a wardrobe staple. 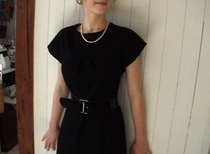 That's the case with a white cotton batiste Burda shirt I sewed in April, 2010 pictured below. 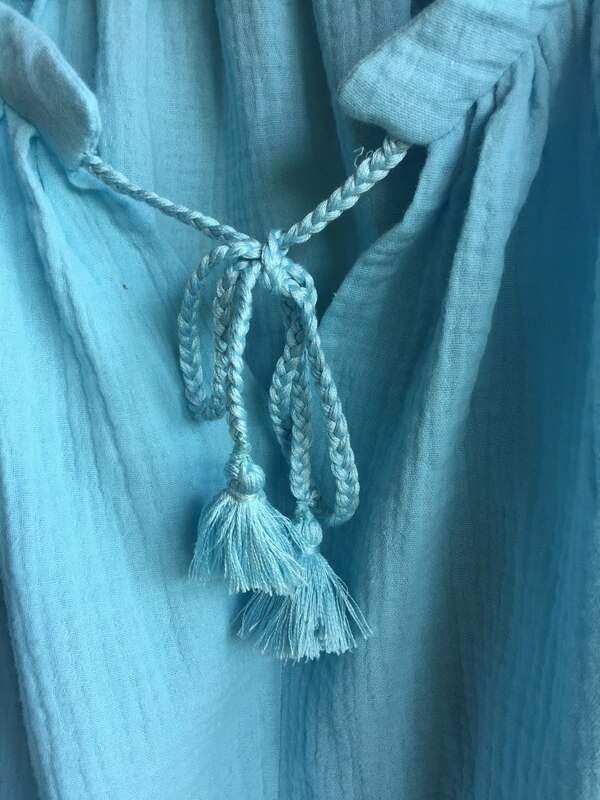 It's rare for me to wear something into a fraying rag, but this cotton was too delicate for a shirt I reached for every week and laundered to death. There was just something about the formal pin-tucked front and the simple 'grandfather collar' that I felt was an old-fashioned classic and could take any scarf or any necklace. 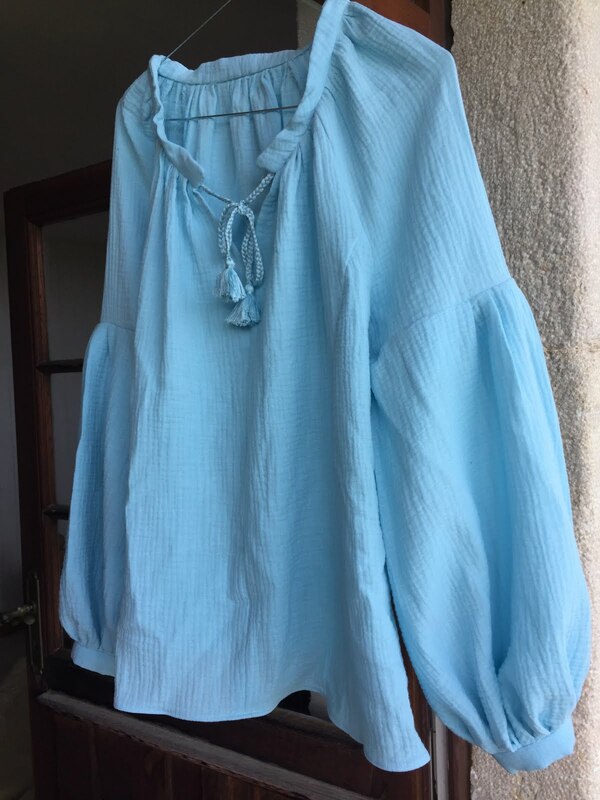 And because it was homemade, I tended to grab it when I didn't want heavy housework activities to risk damaging a more expensive silk blouse or expensive shirt. And it died a noble death. 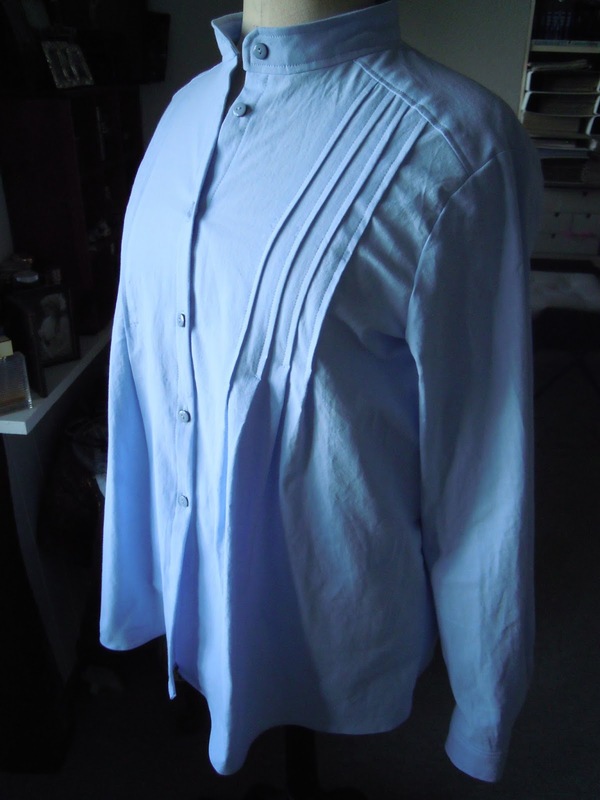 So in 2015 I dyed some sturdier IKEA cotton a pretty sky blue and remade the grandfather shirt for pennies, also pictured below, correcting the sleeve length and figuring that the sturdier cotton would hold up longer. Because it really is a no-nonsense workshirt that has stood up to all kinds of kitchen, garden and laundry abuse, I was rather surprised to see a few weeks ago that the edges of the interfaced button placket are sprouting little holes from three years' wear and tear along the interfaced fold. 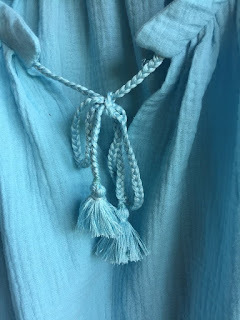 Now I'm really a cheapskate, so when I realized that my beloved blue shirt and I were enjoying our last autumn together, I grabbed some more IKEA cotton I'd previously dyed to toss over a dressing table during the 'Pink and Blue Pantone Season' two years ago. I prefer blue but what the heck. This shirt is often the first step of my day after pyjamas and before a midday swim at the public pool, then shower, real clothes and lunch. 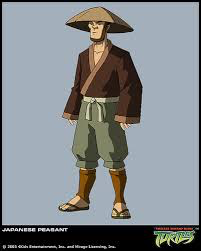 This is not a fashion statement, it's a uniform. Pink will match the dawn sky. 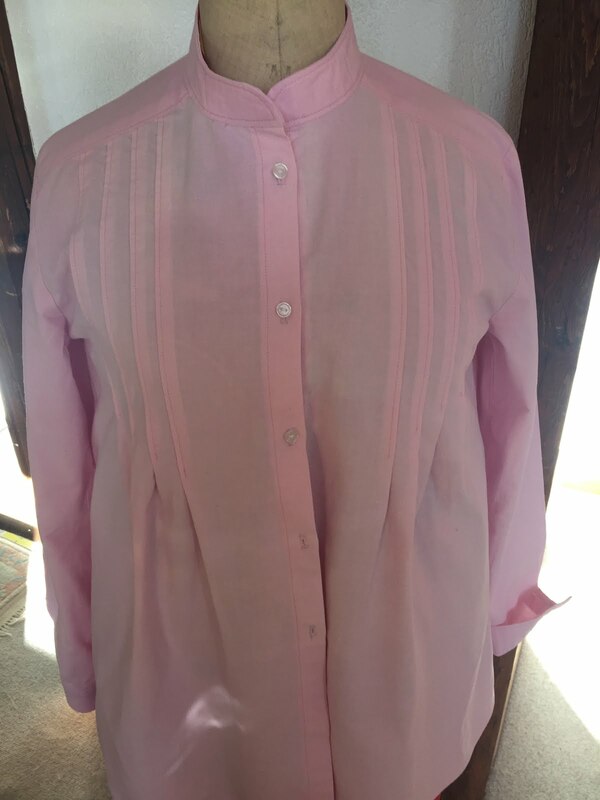 So here we go again—a pink 'grandfather' shirt so humble it will be worn non-stop on those mornings heading into the kitchen for a long cooking-and-freezing session for a mob of visiting musicians, for an afternoon weeding the last of the summer chard, or a morning scrubbing, dusting, ironing or vacuuming. I made one more improvement on the pink version. I usually roll up the sleeves, so I remembered to finish these with French seams. This clean finish is usually reversed for see-through fabrics but it'll take the shirt up a notch from homemade looking. And I took even more care with the tucks and topstitching. 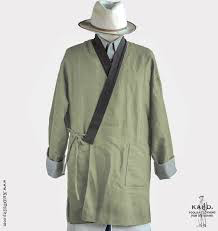 'You look nice,' my husband commented as I set off for town wearing this ivory cotton version of Burda No. 114/115 June 2018. His appreciation was timely as I needed a little encouragement. This is not my usual 'look,' or at least it hasn't been since 1972, my university heyday of embroidered Romanian blouses. If the blue blouse version of this retro-hippie style was easy to carry off lakeside over a bathing suit, (see previous post) I wasn't sure about the full length dress at all with these sleeves. First of all, I am a very active cook in the kitchen. The sleeves (borrowed from the blouse version of the pattern) working over a gas burner are just begging for trouble. On their first test drive, they flopped all over the place and my grown daughter grabbed my arm and rolled the flounce out of the flame's way just in time. Second, I cut a 42-45 but the design turned out to be pretty full already without me needing to be so generous for my hips. If you want to see how different this design can look in a bright silk, check out Ellen's version, here: Ellen's Sewing Passion. Fourth, the dress as drafted is a little too long. I didn't need to add my usual four centimeters to a Burda hemline. I suspect Burda's model below is about six feet tall. Again, a scarf hipwrap helps reduce the length a little as well as define the hip area from ballooning out. I adjusted my plans a bit as I tackled this project. 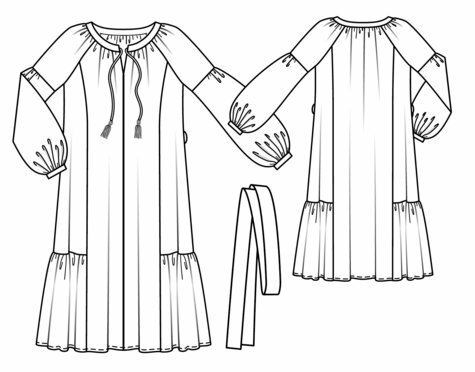 To add the recommended lace insert into the flounced sleeves just took it one step too close to bedtime. So I skipped the lace (mine was too stark white anyway for ivory, as I'd bought it originally for the blue version of these sleeves, viz. previous post) and decided to hoik up the boho effect with leather belts, ethnic scarves and earrings. 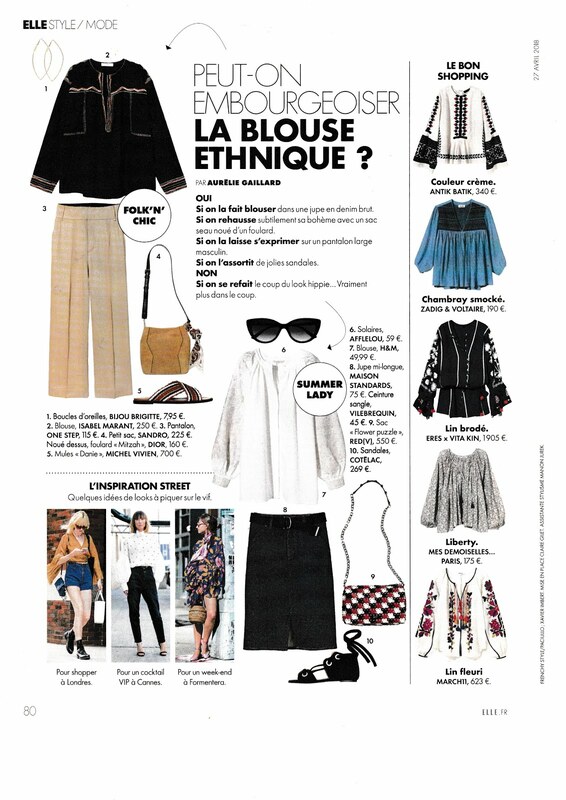 I've posted Elle's inspiration page on the ethnic blouse. 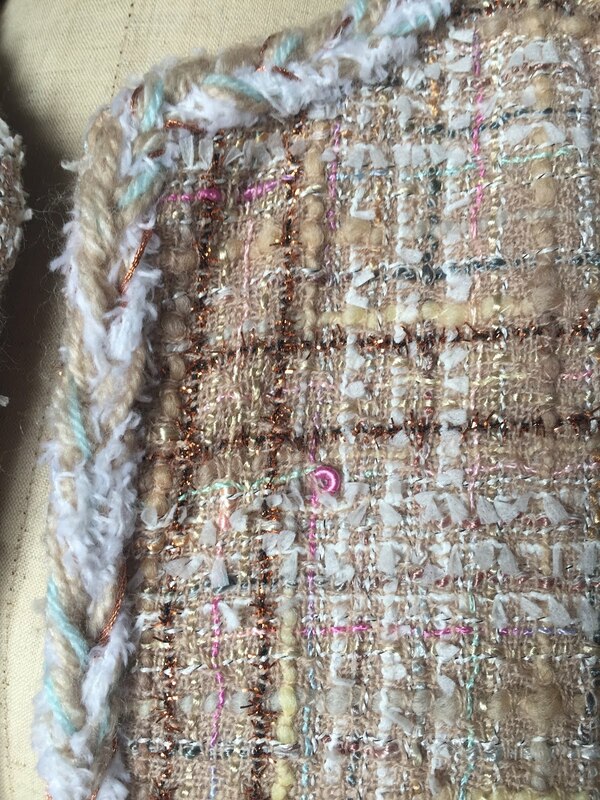 And below is a closeup of my version, sans embroidery, braiding, lace, and a lot of the other seasonal trademarks of the retro-hippie, leaving only my handmade ties and tassles made from embroidery thread bought to match the ivory tone of the fabric. NB I made the tassles more expertly the second time around compared to the blue blouse, remembering this time to work fifteen tie threads to be braided into the strings through the embroidery thread bundle's dual ends before cutting the embroidery thread packet into two neat sections for tassles, then securing the tassles with a 'neck' of encircling thread tightly fastened, and only then braiding the 15 strands of dangling embroidery thread into strings. I bought five packets of embroidery thread to be safe. This saved me all kinds of headaches trying to attach a finished tassle neatly to a separate braid. So if my husband likes it, I'll probably wear it until the weather turns and experiment with jewelry and waist effects—but then, he's an old hippie himself. This BurdaStyle pattern calls for lightweight fabric but because I couldn't find a nice light cheesecloth, I bought two colorways of a more waffley pure cotton—baby blue for a blouse version and ecru for a dress. The fabric type is a bit heavier than I'd like, but I went with it. This stuff wasn't cheap and was actually hard to work with. Imagine—I got quite a shock when I laundered and machine-dried this crinkley cotton from my local fabric store —it wrinkled up so seriously that I was left with only enough for a baby shirt! So, to rescue my yardage, I ironed it out ferociously with a firm pressure and a lot of steam and voila! it was almost back to its original width. Well, aren't I soooo glad I didn't cut out the pieces and then wash them...only to see them disappear. 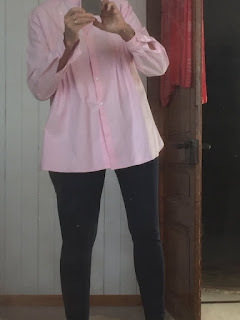 BUT once I'd cut out my ironed fabric, sewn up the blue blouse, and ironed it again, the sleeves nearly dropped to my hip. Giraffe-baby! Whoops! All I can guess is that this fabric is a moving target. This all reversed when I saw what was left in stock at the fabric store. There was only enough blue on the bolt to make a blouse. So, swap the white lace over to the ecru dress version? I toyed with a lot of ideas for multi-colored ties or purchased cord, but in the end, went with braids and tassles homemade using embroidery thread perfectly matched to the color. 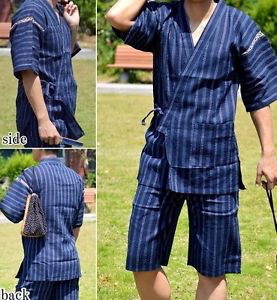 I can't wait to wear this as a lakeside coverup in a week's time camping with the extended family. 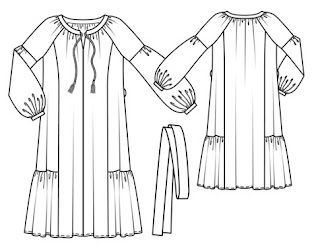 Now, on to the dress with the lace inserts in the flounced sleeve. I'm not risking another ironing-changeling giraffe sleeve. The Japanese workshirt, Burda Easy Spring-Summer 2018, self-bias binding using a bias tool, obi ties— maybe I did something wrong??? 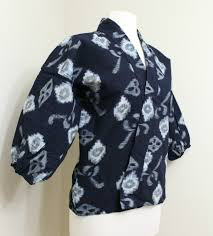 Once I'd dyed my white IKEA cotton a grocery-story-bought indigo, effecting some modest shibori references with a couple dozen rubber bands, I judged the result didn't have quite enough pizzazz. Actually, it didn't have any pizzazz whatsoever. 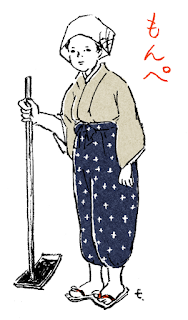 My genuine antique Japanese kimono, (see my tutorial on the Burda kimono) has small flecks of gold paint. So I decided to echo my faint white circles with gold paint to kick the shirt up a notch. This added seven francs' cost plus brush to the cost of my dye for my 'free muslin.' It wasn't entirely a success. 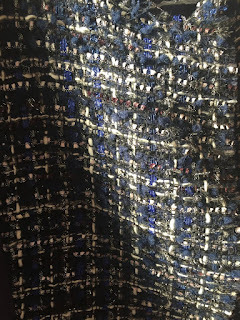 I wasn't in a patient, artistic mood and some of the gold brush strokes look too much like Frankenstein stitches—but for a ten-cent 'early morning shirt' I intend to wear gardening or cooking or writing before my pre-lunch shower, it was enough. Burda calls for bias binding along both long neck edges. I knew I shouldn't cheat there by just overturning a hem once or twice, because the neckline needs stability and there is no facing otherwise. Using the smaller of the two, I was able to use up scraps of my cotton for home-made binding to ensure that the interior edge of the cross-over neckline was super neat and clean. 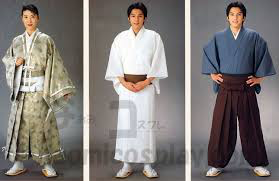 BUT a warning: these obi-style belt ties are really, really, really long and a time-sucking drag to double hem-stitch. I'm suspecting I did something wrong in the cutting because why would they have to go around twice!!?? They're more like Egyptian mummy bindings than waist ties! Other than that, the construction of this shirt is as Burda Easy as they come. Perfect for any beginner. For a muslin first-go, I'm glad I tried it out. But if I use something more expensive than Ditte cotton from IKEA, I'll know I can shorten the ties considerably. 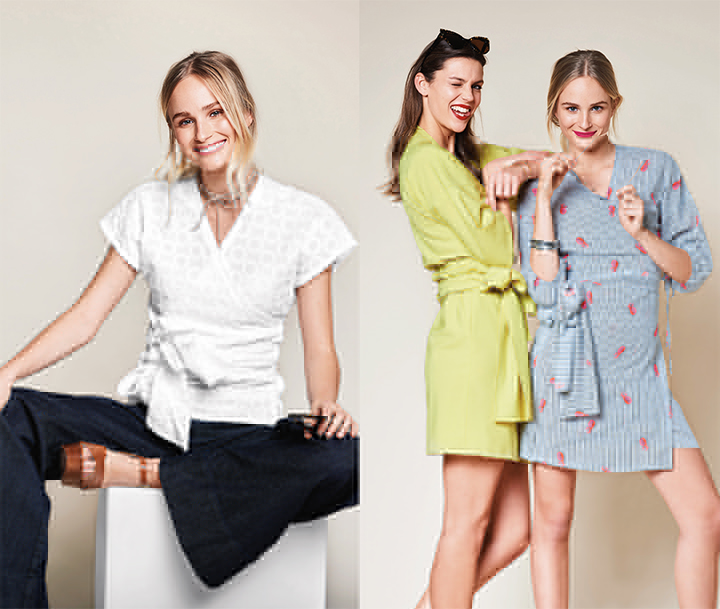 I always keep an eye out for Burda Easy's seasonal signal as to the shirt/blouse silhouette of the summer, (reduced to its simplest interpretation for beginners,) e.g. two summers ago, they gave variations of the off-the-shoulder ruffled Carmen top/jumpsuit/dress. Last year, that morphed into a blouse/dress version of the ubiquitous 'cold-shoulder' tank with straps and a wide droopy ruffle. 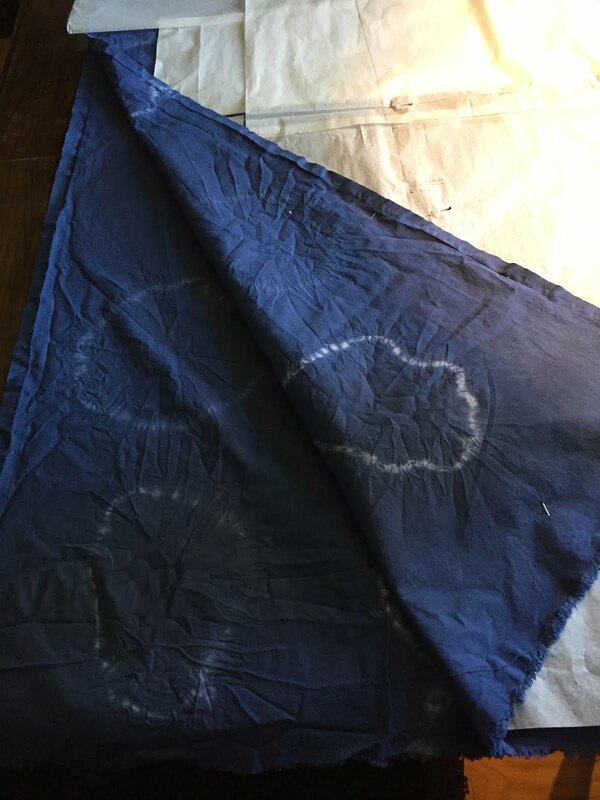 Anyway, I dyed some cheap IKEA white cotton dark-blue with a Japanese tie-dye effect (thanks to some strategic rubber bands) and have cut out my sleeved version of the shirt. Below are some inspiration photos as I get sewing. many years ago which presented this problem. 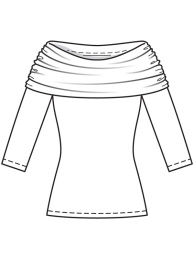 As soon as you lift your arms, the bateau neckline bounces up and becomes a cowl. Anybody know how to avoid this? Maybe by tacking the collar down at the sides somehow? As of 2017, Rakuten Overdrive is second only to Amazon as the world's biggest ebook platform. 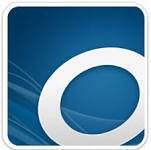 My ebooks are FREE to you at your corner library and Overdrive pays authors fairly for each read. Win-win! 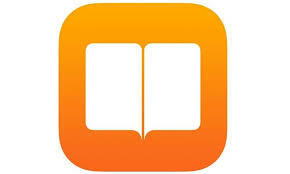 Reading me on your Iphone or Ipad? When Fighting for Love, Get a Warlord on Your Side! I love to sew. I started at age 13 when my legs were four inches too long for McCall's trousers. Fifty years later, I'm still at it, but don't actually need any more clothes. You'll know more than you should about me by picking up a copy of my comic novel, "A Visit From Voltaire," nominated for the Orange/Bailey's Prize for Fiction in 2004. 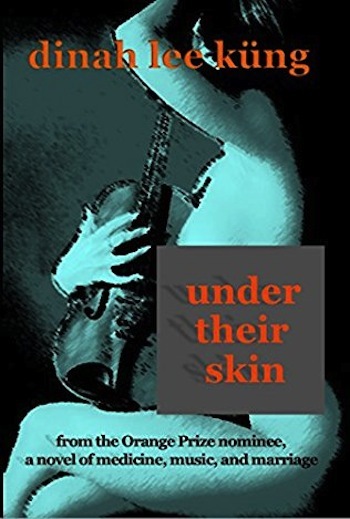 If you prefer thrillers and mysteries, check out the trilogy "The Handover Mysteries" by clicking on the images in above. Everything's available in bookstores or Amazon, iBookstore, Sony, Kobo and B&N worldwide. Happy Sewing and happy reading!